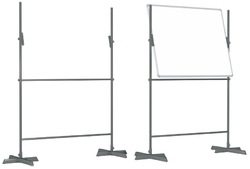 We are offering Revolving Display Stand to our clients.This is a white board stand Which is suitable for Double side white board mostly. A user can write on board one side. after that user can rotate the white board and Utilize second side of white Board. Easy to assembled at site. Packaging Details: Standered One PCS of packing in Corugated Box. Looking for Revolving Display Stand ?